The actress behind one of today's most popular ad characters, AT&T's Lily, is taking on a new public role: an advocate for Syrian refugees. 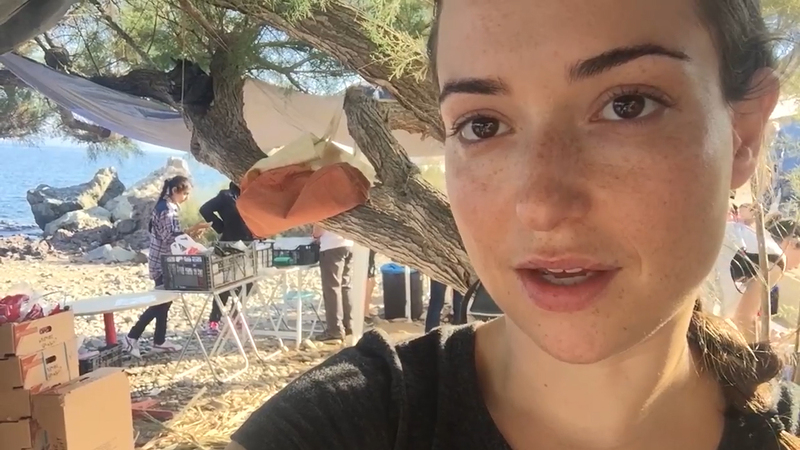 Milana Vayntrub, the subtly charismatic star of BBDO's recent AT&T ad campaign, has just released a 14-minute video called "Can't Do Nothing," documenting her unexpected experience assisting those fleeing Syria's civil war and coming ashore in Greece. "I went to Greece just to go on vacation," she tells Adweek. "I didn't have the intention of staying and volunteering. I love volunteering, but I was kind of ignorant about the refugee situation. It's not really talked about a lot in the news here [in America]. It's not something that comes up very often in my news feed." Most of her fans will be surprised to learn that Vayntrub was herself a refugee, her family having fled the Soviet Union in 1989 in hopes of reaching America when Milana was a toddler. The experience had a lasting impact on her family and helped motivate her to turn her vacation into a journey with a purpose. "I think the hardest part of this," she says in the video, "is knowing how much longer their journey is going to be after they land and seeing them so happy and grateful for their lives and then giving them a little bit of consoling before their very long journey." Vayntrub knows how grueling and stressful a refugee's experience can be. Born in Uzbekistan, Milana was 2 years old when her family fled the Soviet Union, traveling through Austria, then Italy and ultimately to the United States. She, her 21-year-old mother and 27-year-old father had to leave everything behind. They then had to figure out how to survive in places where they didn't speak the language and didn't know how long they'd be staying. "Although I don't remember that time, I do remember settling in each country and feeling like I had one foot in each door," she tells Adweek. "I definitely remember not feeling American, and I have a lot of compassion for that, for being an outsider." But she said even if she hadn't been a refugee, the stories of the Syrians fleeing their homes would have sparked her attention and compassion. "There's this this Somali-British poet [Warsan Shire], and she wrote, 'You have to understand, no one puts their children in a boat unless the water is safer than the land.' And it's true. No one is coming to Greece because they want to live in Greece. They are doing it because it's their only option. They are desperate people." Asked whether she is worried about the documentary possibly being seen as too political for her to retain her role with a brand like AT&T, she said the company knows she has volunteered and knows that she's made a film. While she hasn't gotten a "yay or nay" from the brand about her advocacy, she said she's not worried about any fallout for her advertising work. "I don't think I'm making a political statement, to be honest," she says. "I feel like I'm documenting a war zone. I'm not saying that I should be—there are no shoulds except to be compassionate for these people." Vayntrub has also created a website, cantdonothing.org, which she hopes will be a way to raise awareness about the refugee crisis and to learn more about how people can share their time, money or voice for the cause. "Maybe it will make people feel like they are more powerful than they expected or more capable than they thought previously," she says. She also plans to travel again—next time to visit a Syrian refugee camp in Jordan.